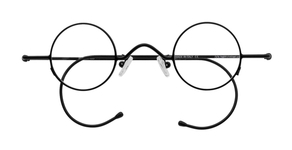 For women, "round" eyeglasses really refers to shapes that are larger and "more rounded." For example, the Jackie Onassis style of sunglasses was a round shape and although not perfectly round, we include that style in determining women's round eyeglasses fashions. 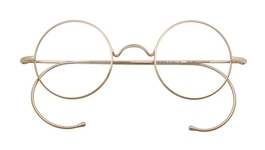 Some women do prefer perfectly round glasses. Typically they look for plastics rather than metals, although we do have a large selection of both materials. The plastics offer a more interesting variety of color options, especially in the Lafont collection, and also the Anglo American AA400. 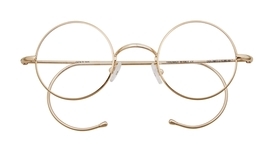 In metal, we recommend the Dolomiti Eyewear collection, which is made mostly from copper in the Italian Alps. 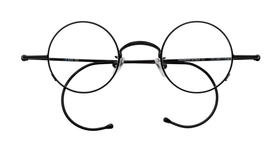 "Almost" round basically refers to a shape we in the eyewear trade call the "panto", which is rounded at the bottom and a touch flatter at the top. The panto shape is favored by academics and others, and is regarded as a more retro style.